More Vertical + No Lines = More Skiing, Enjoy Our Family Friendly Evironment, Long Slopes... No Lift Lines... "Uniquely Coffee Mill"
We are closed for the season! Thanks for a great year! We are already looking forward to next year. Please clean lockers out by 3/17! Thanks for a fabulous year at Coffee Mill!!! Prices do not include 7.375% MN Sales Tax. All of our season passes allow for unlimited skiing and snowboarding throughout the season. Season pass rental packages available for on ski area only. Plan your next group outing with Coffee Mill. This is a terrific opportunity to gather your group and enjoy the majestic settings with fabulous slopes that will entertain all ages and abilities. Coffee Mill offers a centralized Chalet which makes for convenient tracking of group members and no lift lines so you are able to enjoy more slopes during your visit. The Chalet offers a great place to warm up, eat, and have a beverage while enjoying the ability to see all lifts from a single area. Coffee Mill provides a wide range of options to fit your group needs. From tickets, rentals, and food we are here to make your trip memorable. Gather a group of 12 or more and we will take care of the rest. Call or email us to help make your event a success. Coffee Mill, named after a historic navigational point along the mighty Mississippi, offers the best of coulee skiing with a unique "bowl" arrangement for convenient lift accessibility and protection from cold winter winds. Extra long slopes combined with high capacity chairs provide a skiing experience second to none. From the gentle slopes of Chippewa to the radical pitch of O'Chute, each run is obscured from the next by an abundant growth of birch, oaks, and pines. Modern snowmaking and daily grooming insure great snow throughout the season. The majestic area offers fantastic views of river valleys and two states with unparalleled beauty. Coffee Mill Ski Area reserves the right to operate lifts and slopes according to skier/rider traffic and weather conditions. We also reserve the right to revoke the ticket of any skier/rider without warning or refund for reckless, out-of-control skiing/riding or the failure to be under the rules of the Responsibility Code. Drugs and Alcohol: We reserve the right to deny the use of the area facilities to anyone who appears to be under the influence of drugs and/or alcohol. Theft of Services: Skiers/riders without lift ticket will be prosecuted to the fullest extent of the law. Coffee Mill is not responsible for lost or stolen property. We recommend that all skiers/riders use personal locks for protection of equipment. We expect courtesy and respect among all our skiers/riders to preserve the enjoyment of the sport for everyone. Photography:With purchase of services, we reserve the right to photograph people and events for use in advertising or publicity for Coffee Mill Ski Area, without personal consent. Helmets: Helmet use is considered an individual option for both skiers and riders. Parents are encouraged to log onto www.lidsonkids.org for more information. Drone Policy: Unmanned aerial drone use by guests or the media is prohibited without prior written approval of this ski area. Learn to Ski Safely! Coffee Mill Ski School can show you the ins and outs of skiing no matter what your ability. We offer beginner and advanced instruction, plus we make it fun! Group lessons occur on the odd hours, (11am, 1pm, 3pm, and 5pm.) Private lessons are given based on instructor availability. Advanced reservations are not needed for group lessons, but calling ahead on the day you want to come for a private lesson will ensure instructor availability. Please make sure you arrive with enough time to purchase a lift ticket and get your equipment ready. Have fun while learning to ski like a pro! 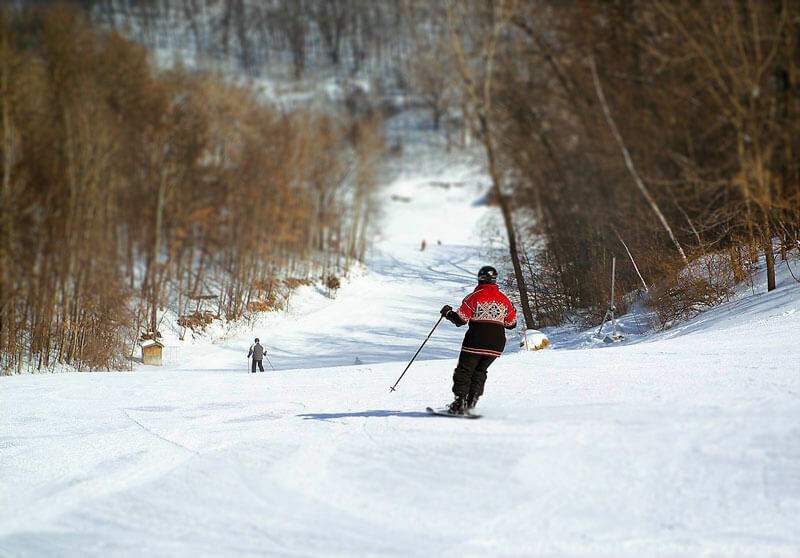 The Coffee Mill Ski Team is for students ages 5 through high school. The only requirement is that the skier can ski intermediate (blue) runs and ride the lift without assistance. The race program takes skiers from their current ability level and develops them with their ability to be better skiers. The season begins with work on basic ski skills and control in varying conditions. These skills are then put to work on the race course for fun, improvement and the thrill of competition. Practices are held on Saturdays beginning at approximately noon and ending around 3:30 PM. Practice dates will be announced as soon as the Coffee Mill Ski Hill is open for the season. For additional information, please contact Elisha Jacobs, Team Administrator, by phone 507-450-4767, or by email jacobs.elisha@gmail.com. The team is led by Head Coach Dave McLeod. The Midwest Snowsports Development League conducts 4 race weekends each year with the fourth race being the Championship Race. Races begin at 9 AM and end with an awards ceremony around 4 PM. If you have a general inquiry, please write by using the form below. Coffee Mill is now accepting applications for the 2018-2019 ski/snowboarding season. Coffee Mill offers a great working environment with flexible hours with an opportunity to ski/snowboard for free. Applicants must be 16 years of age or older to apply. Conditions are great at Coffee Mill and more snow in the forecast. Starting March 1, 2019 - Open Friday,Saturday&Sundays Spring Fling is scheduled for the weekend of March 16/17th. More details to come. See you at the Mill! We are closed today due to poor roads conditions. Please stay home and stay safe! See you Wednesday! Who’s wants to put fresh tracks in powder?!! Wednesday and Thursday, 3pm to 9pm, will be NO GROOM play days at Coffee Mill, sure to bring out the kid in all of us! Remember we are OPEN Monday February 18th for Presidents Day from 10 am to 8pm. Great skiing with a two day total of 10+ inches. Race day Saturday 10am to 1:30. No 4th grade passes can be used February 9th. Coffee Mill will be closed both Wednesday, January 30th and Thursday, January 31st due to the weather. Due to the dangerously cold weather conditions forecasted for Wednesday, January 30th, Coffee Mill Ski Area will not be open. Join us on the slopes and warm up in the chalet with a hot chocolate. We are 100% open today! Closed Thursday January 24th. We will be closed tonight due to the high winds. We will open tomorrow as regularly scheduled. In consideration and exchange for allowing me to use these facilities, I agree to ASSUME ALL RISKS OF INJURY inherent in snow sports activities (skiing, snowboarding). I AGREE NOT TO SUE Coffee Mill and it's owners and employees (hereafter "ski area"), and I agree to HOLD HARMLESS and RELEASE this ski area from liability for NEGLIGENCE, STRICT LIABILITY or BREACH OF WARRANTY. In accordance with Minn. Stat. 604.055, this does not apply to claims for greater than ordinary negligence. I AGREE TO DEFEND AND INDEMNIFY this ski area for all claims arising from my use of this ticket, including for attorney's fees. If a user is a MINOR, I agree, as the PARENT/LEGAL GUARDIAN, to defend and indemnify the ski area as to claims brought by the minor. I agree to the terms of this Release on behalf of the minor user. I understand snow sports at this area are INHERENTLY DANGEROUS, which cause SERIOUS INJURY OR DEATH, including from variations in snow conditions and terrain, changing weather conditions, ice, rocks, forest growth, bare spots, fencing, lift loading and unloading, towers, utility poles, jumps, and terrain features, snow making, snow grooming equipment, pipes, hoses, collisions with others, collisions with natural and man-made objects, loss of control, stumps, cliffs, steep terrain, unmarked hazards, entanglements on or falls from lifts, and/or ski racing, and I ASSUME ALL RISKS. I agree to use all facilities safely and have the ability to safely load and unload lifts, will read and follow all signage, will follow all verbal instructions, will control speed, will avoid snowmobiles, snow groomers and other natural or man-made objects, and will ABIDE BY YOUR RESPONSIBILITY CODE of the National Ski Areas Association. © 2019 Coffee Mill Ski Area.